Just like most of domestic gas cooker, IZOTON hobs/gas cooker requires only LPG regulator. 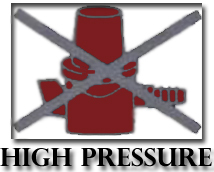 High Pressure regulator strictly cannot be used as the gas pressure is too high that it may cause explosion. You are advised to purchase LPG regulator with SIRIM approval. Likewise, for the gas hose, please choose the type with re-inforcement and SIRIM approval. 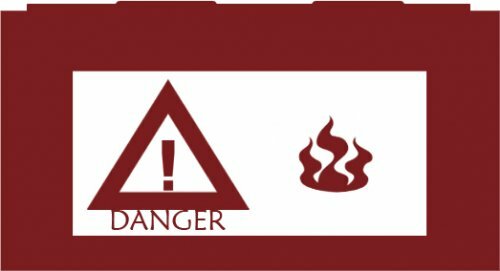 You are strongly advised not to place your gas cylinder beneath the hobs/gas cooke to avoid unnecessary fire should it be any gas leak from the hob/gas cooker or regulator or even gas cylinder. You must make sure that burners are always clean at all times. The holes on the rings/caps are not blocked by cooking gravy. The blocking may cause the flame becomes smaller and the gas will be blocked also. If the gas continues not flowing smoothly to the burner, it might get stuck under the burner and pose danger as the fire can be sparked off anytime from the bottom. Backfire is the term used to describe a situation where the gas cannot flow smoothly to the burner due to blockage and instead of having the flame on the burner, you might see the flame spark off from the bottom or inside hob. If this happens, you might get burnt and internal part of the hob might also be destroyed. Backfire can be dangerous, it usually happens when your burners are not well cleaned and maintained. Of course, it might also happen if there is a gas leak at the bottom of the hobs or gas cooker. There should not be any gas smell during cooking as the gas is always in combustion. However, if the smell persists, you must stop using your gas cooker//hob immediately and get a qualified technician to check your hob/gas cooker, hose connection & gas regulator. Furthermore, whenever you change a new gas cylinder, you must make sure that the gas regulator is being placed correctly and firmly onto the gas cylinder. If you are not sure, please consult the gas-cylinder delivery man. You must turn off your regulator at all times when your gas cooker/hob is not in use. Regulator and gas hose must be changed on the yearly basis. Failing to change the regulator and if your regulator goes mulfunction, it can pose a serius threat to users as the gas pressure might change unpredictably high, the excess of the gas at burner might cause explosion. The cabinet beneath the gas hob must be well ventilated at all times. 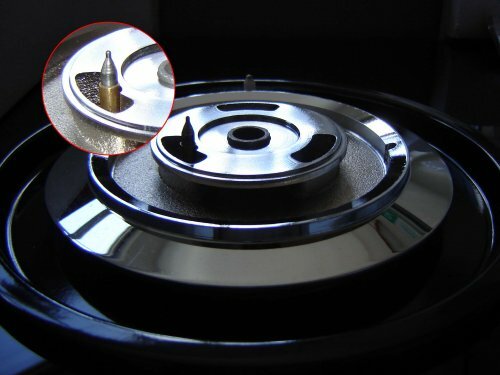 For those hob with air-inlet adjustable knob at the bottom, you are strongly advised not to open or close the cabinet door too often while the hob is in operation as it might affect the flame. You may feel safer to have a hob without safety device; safety device is a type of mechanism used to cut off gas from continue coming out from burner if the flame is accidently extinguished either by overflow water from pot or blown out by wind. Once flame is extinguished accidently, the thermocouple sensor (copper-stick next to your burner) will detect it within 30 secs and further cutoff the gas from the burner head. But, bear in mind, the gas supply is still continuing flow from the cylinder to the hob; you are advised to turn off the regulator immediately. For hobs with safety device, you must continue pressing the knob for about 10 secs so to make the flame stay, otherwise, once you let go, the flame will go off. You must also always ensure that the thermocouple is clean all the times so to be effective. If the thermocouple is not clean, you might find that it's hard to get the flame to stay when you turn the hob on; furthermore, if the thermocouple might not function if it's not clean; in this sense, hobs without Safety Device has definitely less maintenance. You must use 240v 50Hz 13Amp Switch Socket with Single phase & safely earthed. It's recommended to have a separate switch socket for your cooker hood, this is necessary as you will have to turn off your cooker hood when you need to clean your cooker hood. You need to have a flat concrete wall to hang a cooker hood. Wall made of any kinds of wood is not suitable to hang cooker hood as the hood can be as heavy as 25kg. Generally, Slim hood is in the range of 12 Kg to 15 Kg, while Chimney can be from 19 Kg to 25 Kg. 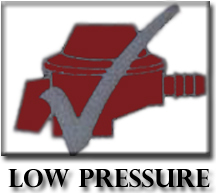 Strong steel wall plug & screw must be used to tighten the hood onto the wall. You are advised to engage an experienced/qualified installer to do the installation for you, an improper installation can make the hood to run ineffectively or even the whole hood can come down. 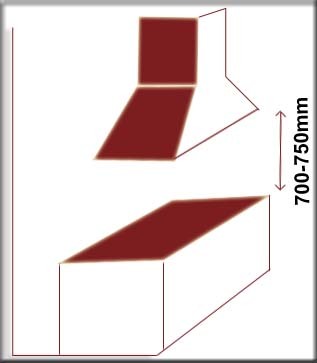 The optimal distance between table top to the bottom of the hood is 700 - 750mm; If the distance is more than 750mm, the absorbing efficiency will be lesser, again, if the distance is lower than 700mm, the heat dissipated from the stove might cause problem to the components of the hood and even the oil cup might melt. Cooker hoods must be well maintained at all times; oil cups must be clean on the weekly basis, failure to clean the oil cup may cause fire. 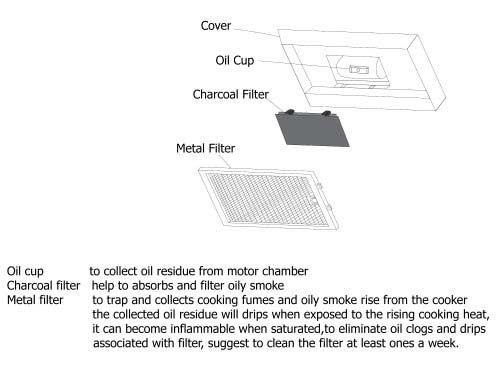 Please take note that some models might have oil cup placed after the metal filter*, you might have to take out the metal filter before you can reach the oil cup. If your cooker hood has metal filter(s), you will also have to make sure your metal filter(s) are not blocked by grease & dirt; otherwise your cooker hood will become inefficient and also the grease may pose a fire danger. If your cooker hood is re-cycled type, you will have to change the active Carbon filter regularly, says every 6 months; failure to change the Carbon filter may cause your cooker hood becomes ineffective. You are advised to cutoff the electric supply before cleaning cooker hood. Please also DO wear glove during cleaning as the edge of cooker hood or its internal parts can be sharp & finger-cutting. You should also ensure that any electric parts of cooker hood must be kept dry during cleaning. You may also call us or our authorised dealers to arrange for qualified technician to attend the cleaning for you (some charges will incur). For those who may prefer to have smoke to be ducted out, you might purchase aluminium flexible hose in the diameter of 6". It usually comes as 6ft or 10ft in length per piece. During your house renovation, you have to ask your contractor to make a hole with diameter* of 6" where later you may purchase a so-called wall-cap to place from outside your house. This wall-cap will prevent the hole to be seen from outside and with the aluminium wire inside the Cap will prevent insect or small animals from going in. Aluminium duct hose & wall-cap can be purchased from any IZOTON authorised dealers. * Your might have to consult our dealer for the appropriate position of hole supposed to be made, the center of the hole is usually 750mm from the bottom of the hood; however, the actual position may vary from model to model. 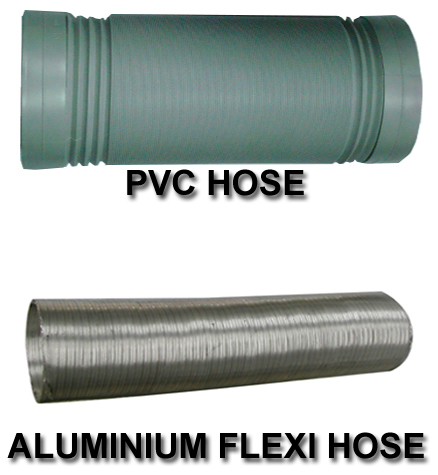 In general, you are advised to use Aluminium Flexi Hose rather than using PVC Hose. Aluminium Flexi Hose is more durable and you might not have to replace it for some years; well, if your hood usage is very low, you might not even have to replace it for more than 5 years. For PVC hose, it's not so durable, with high room temperature in Malaysia, you might have to replace them after some years, of course, it depends a lot on the usage of the hood.